Prodrugs, inactive medications that are metabolised into an active form within the body, are able to hijack human peptide transporters PepT1 or PepT2 and hitch a ride directly into a cell. This process allows for the accelerated absorption of a drug into a patient’s bloodstream. While prodrugs are clinically effective, little is known about the peptide transporters themselves at the molecular level. Research groups lead by CSSB/EMBL scientists Christian Löw and Jan Kosinski are now a step closer to understanding the structures of peptide transporters and how they recognise, bind and transport prodrugs. 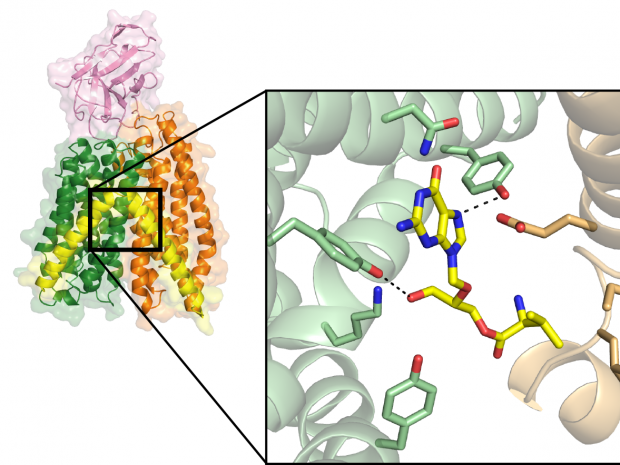 The groups recently determined a high-resolution crystal structure of a peptide transporter in complex with the prodrug valganciclovir: a medication that combats certain viral infections. Their results, published in the Journal of the American Chemical Society, could assist in the design of prodrugs with improved absorption rates. The Kosinski group built a high-quality structural model of the human PepT1 transporter in complex with valganciclovir using the DtpA crystal structure as a guide. “The model,” Kosinski explains, “shows that human PepT1 very likely binds the drug in the same way as DtpA and pinpoints the exact amino acid groups responsible for binding.” This research could facilitate the development of new prodrugs with improved absorption rates that could lower pharmacologically effective doses and reduce the negative side effects experienced by patients.